Inflatables in strong PVC bag, blower in standard carton. T/T 50% , Western Union, MoneyGram, Paypal. Lead time Fast delivery, in 15 days when the order is confirmed. Package Inflatables in strong PVC bag, blowers in standard carton. Printing Digital printing, silk printing and hand drawing, according to requests. 2.You pay 50% of total price as a deposit to get order started. 5.When the order is confirmed, you pay the balance, then we arrange the shipment. This Hippo usually put beside beach, inflatable amusement park , huge square and so on , there have enough water for sycle and a lots of people play with it ,you can put some inflatable games beside for people to use when they slide down,very exciting. We use 0.55mm pvc tarpaulin material for the sides and leg sub-structure .The original size of this hippo is 53.3mL*14.3mW*11mH. the slides size is 3.6m wide, with 2steps go up, and one slide go down, the body of the hippo is 30m long, and 18.6x14.3m dimemsions is the leg structure. Other 23.3m long included 15m extension and 8.3m landing bed. The Hippo operates on two high output single horse power blowers, producing 7.5 inches of static pressure. Inflation time from start to finish is incredibly fast, taking only 15 to 20 minutes. Blowers must be plugged into GFI grounded circuits. (A) United States & Canada: Inflate with 4 x 115v 2HP blowers. (B) Other Countries: Inflate with 4 x 220v 2HP (check required voltage for your country). Maximum wind load: 45 mph. For safety reasons, do not operate The Hippo in sustained winds exceeding 25 mph. The slide can be easily cleaned with a cloth or light bristle brush. Use a silicone based solution to refurbish the vinyl. Rinse thoroughly and dry before storing. 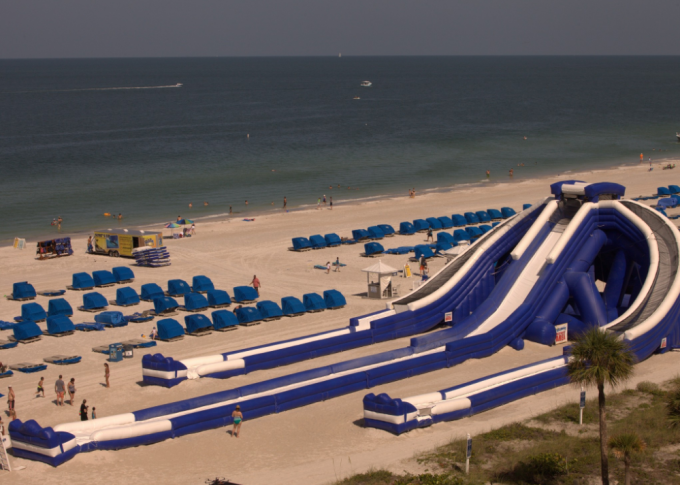 To transport the slide, either use a 14 ft. truck with a minimium load capacity of 6,000 lbs.or use a 6ft x 12ft double-axle flatbed utility trailer with a 5,000 lb. carrying capacity and a vehicle with a minimum of 6,000 lb towing capacity. When storing the slide, The Hippo should be stored in a climate controlled storage unit. 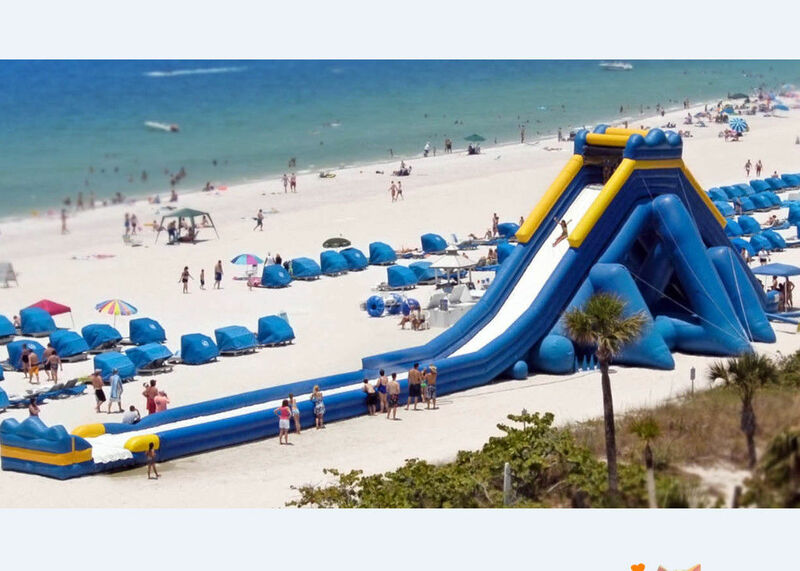 The slide will fit in a space no larger than 12ft x 6ft x 6ft high. 2) We install high quality air relief valve from UK on all the items of this water park, so the items can release air to a safety level automatically when the air pressure getting higher. 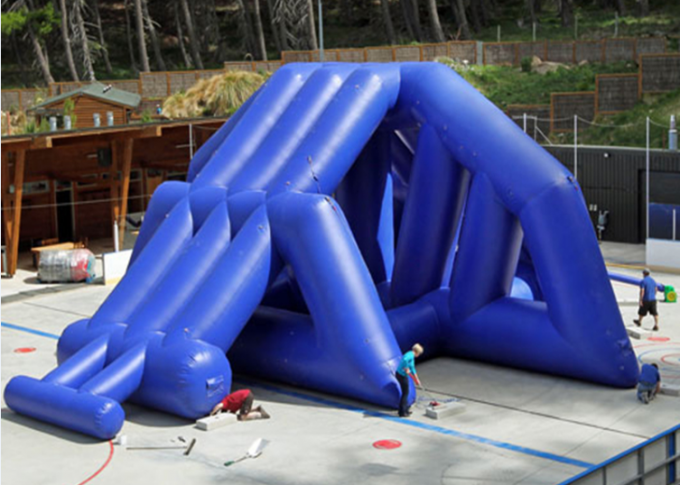 4) Material: We use best 0.55mm PVC tarpaulin for water games. 5) Printing: Digital print, silk print, or hand painting. The high level painting makes Topfun product will not be sticky and color fade, but sustain a long time. And it print quickly and in good quality. Further more, we make a liquid protecting film on the surface of digital printing,. 7) Strong package bags: We spread air out to help deflation before roll the game, then put a band belt outside to tie it. We will use tarpaulin bag which is same material as the games to package the units. So the packages will not be frazzled during delivery process. For big units, we will make extra handle band outside of the packages. In order to let you find your goods quickly, we will paste a mark paper with your order number. 1. How about the sales terms and warranties? Our products have been exporting to more than 50countries and regious around the world, 95% up abroad. Most products come with a one-year to three-year guarantee. 2. Do we make custom designs? We sells products worldwide.We can make the necessary adjustments required to meet your local power systems.Payments are accepted through T/T, Western Union and Paypal. Here have Trippo for your another options, if you like it, please contact us too.